I've got a photo of a ballet dancer for you today. Oh, it seems like such a long time since that photo was taken. Five years: just before she left Primary School and moved on to other things. Seems like a whole lot longer again since I gave up ballet. That was after about three weeks of lessons, one pair of specially ordered shoes because my feet were so tiny, and one altered leotard. But I was six, we had just moved to a new town, with a new school, and staying on late in the afternoons just felt like a little too much. No, I'm not often a quitter, but after school ballet had me beat. ...but my Mum knew I needed encouragement and she tried to help. One day, when I wasn't there to stop her - argh I wasn't there to stop her - she decided to tutu-up the leotard. How can I best describe it? Quickly, I think, so I get it over with. She sewed layers of lace on. And it did look much prettier. But it wasn't right. It so wasn't right. It wasn't the same as the others How could I tell her? I hung up my shoes. I'd had enough. But The (Not So) Small One, who also started when she was about six, kept going. She had pink tights and pink shoes and hair that had to go into a bun. Every Monday. Three O'Clock. Sharp. And when Get It Scrapped asked for a page using tulle, her pink skirt, which still hangs in her wardrobe, was the first thing I thought of. I found a piece of tulle and I gathered it into a ruffle to put on a page. It covers the journaling, just a little, those words about buying the right uniform and fitting in with the crowd. Ballet Rules, but - woa, does ballet have rules. My girl found after school ballet a bit much too. She moved onto Irish dancing a couple of years later, but the teacher was very shouty so her dancing career came to an end there. The perfect page for tulle. We never had stuff like that at school. We had to go to a dance studio. I did a 'term' of ballet, which was 10-12 weeks I think, when I was 8 but I was bad at it so I switched to tap, and was equally bad at it. So they moved me to gym classes at the YMCA and I proved bad at tumbling, gymnastics and even trampoline! I just wanted to be left alone to read books. I loved ballet (even though I think I was kindof awful at it). I took class all through high school and even (occasionally) in college. I think it's responsible for my good posture and flexibility (even at my advanced age). Clara only stopped dancing a few years ago, and I'm sad she stopped. Now she wishes she would have kept with it, although I KNOW there's no way she could fit it in with all her other activities. I forgot to say - what a great layout! I love how the journaling peeks out, and the little butterflies. Fab page - great photo too! I did a similar amount of ballet to you - hated it! And was relieved when my own daughter didn't get the bug! Lots of rules indeed! I have two ballet dancers here gearing up for a show next week. Lots of costumes that have to be just right. I will be spending my bank holiday sewing. Love this page and the post that goes with it. R did ballet from 3 years old until about 14, along with modern, tap, jazz ... You name it, she did it! And every one needed different colours, different hairstyles and different shoes. I daren't think about how much we spent on dance classes! As for me, well I waited until I was in my 30s to do any dancing - and then I chose tap! I loved ballet but sadly lessons didn't last long, hmm don't remember why I stopped. Lovely photo and I too like the way the tulle supports the photo (in both ways) and partially hides the journaling. The tulle looks such fun! And I love how it 'curtains off' the journaling.....I always WANTED to do ballet - never got the chance, so did it as an adult.....& LOOOVED it!!! what a gorgeous layout and the tulle is just so lovely. Pretty pretty. I never did ballet - bit a of hefalump as a child! - but I later did tap. Not so many rules but far more noise. The tulle is just perfect on this pretty layout. I'm afraid I hated ballet....and didn't last long with it at all. What a gorgeous layout---the soft colors, the tulle, the embellishments are a perfect match for the lovely photo! The tulle is a great addition to this layout & I like how it allows you to cover some of the journaling but still know it's there. I never took any dance classes growing up - we just couldn't afford them, but I get new dance photos (some ballet) each year from my nieces' dance recitals; I'll have to keep this idea in mind for a layout. 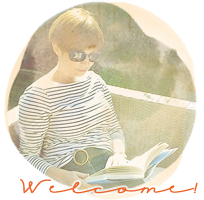 your layout is so soft and beautiful - perfect for the topic - and the story well told. I took jazz dance in high school (my first dance classes) and then tried a ballet class in college. I pretty much hated everything about it. The movement was so rigid and un-natural. I went back to jazz! I love the page, especially how the tulle looks like a curtain. An adorable layout and story to go with it. 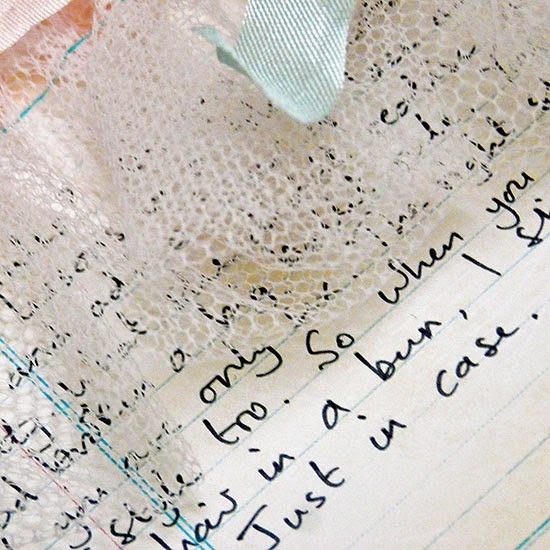 I adore that tulle gathered across your page to softly hide the journaling. Just so sweet! Your page is totally sweet - thanks to the tulle and the adorable ballerina. Loved hearing the whole story too. Love the page! Gosh your post made me remember (I'd totally forgotten) that I did take ballet at one point. I think both it and ice skating were too much and one had to go. This such a beautiful page (so girly!) accompanied by an even better story. I love how often (and this is just one instance) your stories revolve around experiences you and your daughter share.